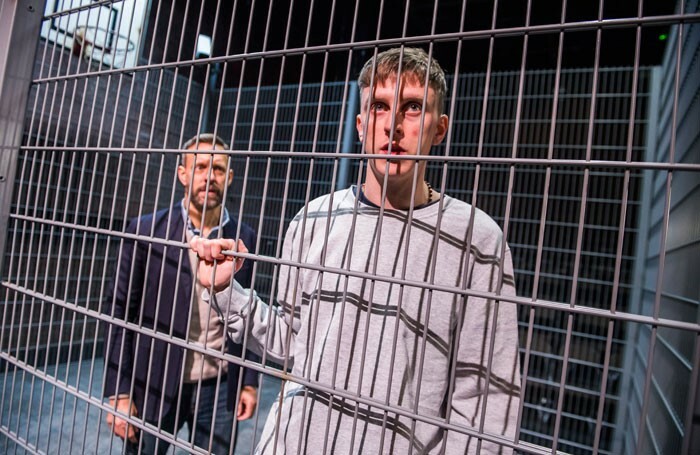 A playwright wants to write a play about patricide, but with an actual criminal onstage instead of an actor. Initial research leads him to a young man called Martin Santos, serving consecutive life sentences in Belmarsh for killing his father. As weeks pass and the two men get to know each other, stereotypes and expectations are upended in this moving story of masculinity, violence and theatre. Within 50 years of Shakespeare’s death, playwriting was changing quickly. Less flowery language and more powerful female characters are prominent in James Shirley’s rarely-staged The Cardinal, written in 1641. The plot is more streamlined, but some of the outdoor playhouse performance conventions linger along with the grandness of the king’s court. The story proudly flaunts influence from earlier revenge tragedies and is no less bloody, but easier to follow than some of those on stage a few decades or so earlier. In Southwark Playhouse’s smaller space with historical costumes, Justin Audibert’s production evokes the intimate atmosphere of indoor playhouses that were beginning to take over towards the end of Shakespeare’s career. A self-described modern rep company, Merely Theatre is addressing Shakespeare’s gender problem with 50/50 casting. Five male/female pairs each learn a set of characters in two plays, then on the night it’s decided who will perform. The result is a focus on clear storytelling rather than unimportant details such as the appearance or gender if individual characters. It’s a great device, and partnered with simple staging and a pace that doesn’t hang about, artistic director Scott Ellis has created a distinctive style of performance honouring the historical aesthetics of travelling players, though there’s a lack of nuance dissatisfying to modern audiences. Persephone and Eurydice’s myths are defined by men. What happens when these men are removed and the characters plunged into a modern dreamscape? Maud Dromgoole’s Acorn brings these women and their fates together in a world of fragmented narratives and moments of biting wit, but the worlds that Dromgoole weaves together are so disconnected from each other in this cerebral play that it interferes with its immediacy. Rather than nurturing plants, this Persephone looks after people – she is a doctor, but one that struggles to connect with her patients. Her opening monologue justifying her disdain for patients’ personal lives is equally hilarious and disturbing, the best scene in the play. Deli Segal brings a simple humanity to this cold character, making her quirky and likeable despite an autistic-like inability to understand others. 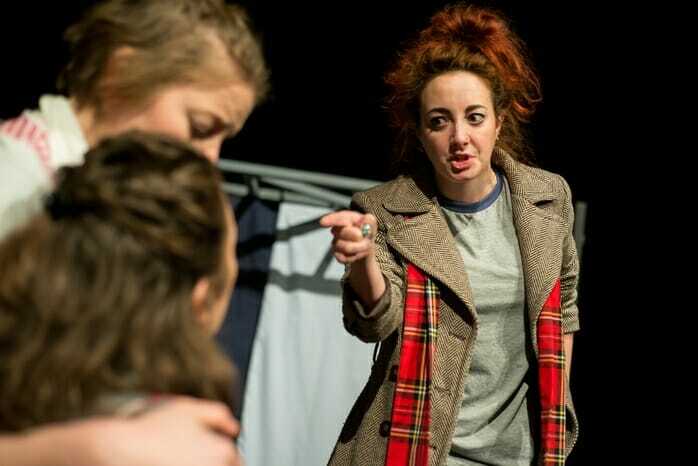 Lucy Pickles’ Eurydice is a sweet contrast, alternating between a blushing bride and mental health hospital patient. Pickles is no less of a performer, but Persephone has the more dynamic and well-written character. Dromgoole employs a range of styles, arguably too many for an hour long script. Though this strengthens the ability to relate to the story within individual scenes, the overall effect is one of indecision. An unrelated, recorded dialogue between two men fills transitions unnecessarily and doesn’t link to the women’s stories, then overlapping speech cause dialogue to be missed. Phil Lindley’s design is simple and precise, allowing for detail and layers to emerge through Jai Morjaria’s lighting and Tom Pearson’s underused projections. The design concepts are most excellently married and add polish to a script that feels under-developed. Acorn certainly deserves to extending and refining – the characters are excellent, as are the foundations of the stories seen here. Dromgoole uses language well and is clearly confident experimenting with form, style and classical influence, but reinvention with the goal of creating a modern myth doesn’t quite reach the enduring scale of the original material. Acorn runs through 29 October. That which goes up must eventually fall. Christopher Marlowe’s Tamburlaine the Great tells of the title role’s rise from common thug to emperor of Persia and Africa. A precursor to, and probable influence of, Shakespeare’s ruthless Richard III, the man is needlessly brutal: he orders rivals’ remains displayed on city walls, women and children killed, manipulates others to join his cause and then betrays them. Fate eventually catches up with Tamburlaine after he sets fire to books, including the Qu’ran, and proclaims himself more powerful than God. Lazarus Theatre Company returns to form after a disappointing Henry V with a modern, concise presentation of Marlowe’s play depicting Tamburlaine as a violent, string vest wearing hood rat transformed into a suited and booted world ruler. Social mobility is the dominant theme, emphasized through Rachel Dingle’s costume design in this rags to riches tale. With visually arresting movement sequences, skillful use of light, and pointed similarities with Middle Eastern politics, immigration and Western meddling in the region, this is a relevant, well-crafted adaptation of the Elizabethan original. The defining feature of this Lazarus’ adaptation is the extended movement sequences, with a powerfully striking one opening the show. A large cast use militaristic stylization and East Asian performance techniques to slowly travel across the stage, setting the tone for Tamburlaine’s merciless and unfeeling crusade. The choreography is precisely angular and even though the actors are well-rehearsed and the effect is visually stunning, there are hints of restrained self-consciousness from some of the company. Accompanied by deep, tonal sound design by Neil McKeown with the actors smartly dressed in modern suits, it reflects the contemporary Western political machine that coldly invades other countries. These sequences are used throughout, enough to be effective but not so much that they lose their power. No choreographer is credited, so they are assumed to be a product of co-directors Ricky Dukes and Gavin Marrington-Odedra. Performances from the company of 15 are good, with delivery occasionally broken and overindulgent. These moments are rare and don’t affect the pace or energy of the cast as a whole. Particular highlights are Kate Austen as the aggressive, trackie-bottomed Techelles who is Tamburlaine’s number two. She never loses her fierceness, even when Tamburlaine’s success means she has to wear a fitted dress. Robert Gosling is the simpering, camp Mycetes, Emperor of Persia. He’s a great contrast to Prince Plockey’s earthy Tamburlaine. Alex Reynolds is the captured prisoner Zenocrates that Tamburlaine woos and makes his bride. Her transition from victim to doting wife is a disturbingly good example of Stockholm Syndrome, reinforcing Tamburlaine’s power and manipulation. Lorna Reed plays three smaller roles, with a calm strength and subtly powerful voice. She would make an excellent Hermione or Lady Anne. The bombastic Bajozeth, Emperor of the Turks, is played by Alex Maude and is a joy to watch, particularly when imprisoned and force fed by Tamburlaine. There are few weaknesses in this Lazarus production, but those that are present are minor. Tamburlaine’s final speech has too many pauses and the use of five identical crowns can cause confusion as to which character is the most important at any given moment. There was also an unsatisfying lack of blood considering the play’s violence. However, fringe productions tend to not have a dry cleaning budget; having the Mads Mikkelsen-as-Hannibal Lector suits cleaned daily would cost a small fortune. Artistic director Dukes’ flair for updating classical theatre with contemporary relevance and visual staging is at its finest in Tamburlaine the Great and is certainly worth a watch, particularly as it’s a play rarely staged.